Larger ensuite room, King size double bed & lovely loch views. Egyptian cotton linen, comfy mattress, imitation goose-feather duvets. Scottish Fine Soaps toiletries. Flat-screen TV, goodie basket with range of teas, coffee, Borders biscuits & bottled water plus free wi-fi. Cosy ensuite room with two 3' twin beds. Egyptian cotton linen, comfy mattress & super soft imitation goose-feather duvets. Scottish Fine Soaps toiletries. Flat-screen TV, goodie basket with range of teas, coffee, Borders biscuits & bottled water plus free wi-fi. A basic room with two sets of bunk beds sleeping up to 4 people. Room has beautiful loch views, flat-screen TV, range of teas & coffee, Borders biscuits & bottled water plus free wi-fi. Please note this room has a shared bathroom across the corridor which has a bath with shower over. 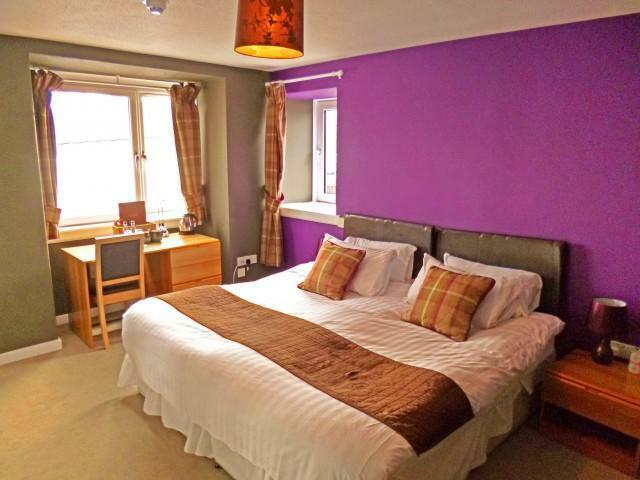 Cosy ensuite room with double bed and beautiful loch views. Egyptian cotton linen, comfy mattress & super soft imitation goose-feather duvets. Scottish Fine Soaps toiletries. Flat-screen TV, goodie basket with range of teas, coffee, Borders biscuits & bottled water plus free wi-fi. Organic Scottish porridge oats with cream and a nip of whisky! You can also help yourself from our breakfast table with freshly squeezed juices, home-made muesli, cereals & yogurt, freshly brewed teas and coffees, fresh baked pastries and Ullapool Bakery bread, fresh cut fruits and locally made preserves. "*NEW* All our guest rooms have been completely refurbished to a stylish but cosy modern design. We are a small hotel with only eight rooms, a mixture of doubles and twins with one bunk room. One of the best features of our rooms is our location. All but one of our guest rooms looks out over the loch giving stunning views of Loch Broom to the mountains beyond. In all but summer time these high peaks will be quietly snow capped; fishing boats bob in the harbour and once or twice a day the Calmac ferry arrives at the port from the Western Isles. We offer freshly cooked Scottish breakfasts including a full Scottish with local sausage and free range eggs, local haddock with poached eggs and scrambled eggs with Ullapool Smokehouse smoked salmon and porridge with cream and a nip of whisky! We also offer a full continental selection (seasonally) with fresh meats, cheeses, fruits, cereals and locally made muesli, pastries and artisan bread products, nuts, yogurts and fruit juices.